WUBE-FM's 50th anniversary logo unveiled today. Nashville has been supportive for five decades, sending young up-and-comers like Reba McEntire, LeAnn Rimes, the Bellamy Brothers, Billy Ray Cyrus and others for free shows at Taste of Cincinnati or B-105's old "Free Day in the Country" before they were stars. "When we signed Billy Ray, nobody knew him, not even us," recalls midday DJ Duke Hamilton, who came to WUBE-FM in 1977 when actor Danny Kaye and Les Smith owned the station through their Kaye-Smith Enterprises. "Right before he got here, 'Achy Breaky Heart' hit and people were standing on cars and in trees to see him." 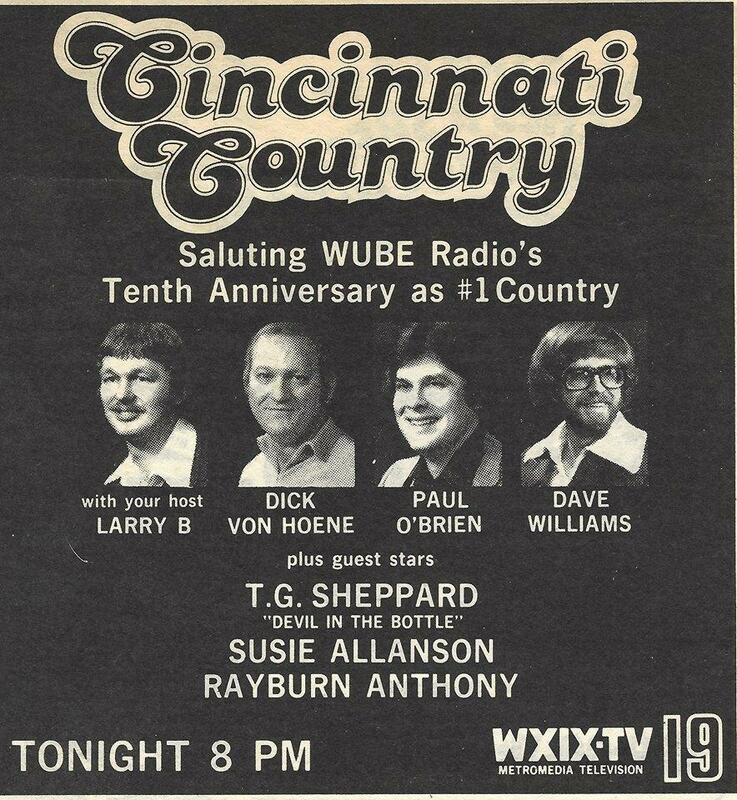 WUBE-FM celebrated its 10th anniversary with a WXIX-TV special in 1979. 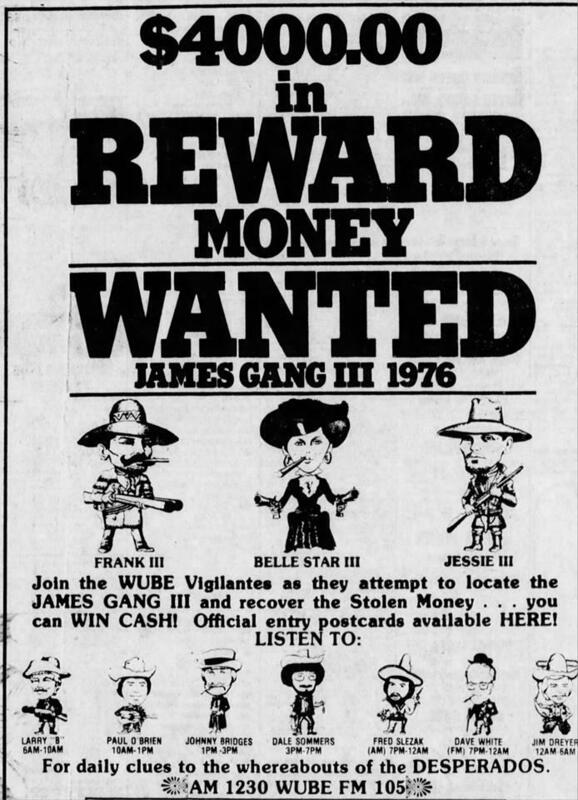 It all started with 1230 WUBE-AM switching to country by playing Hank Snow's "I'm Movin' On" on April Fool's Day in 1969. Eighteen months later, in October 1971, WCXL-FM changed its call letters to WUBE-FM under Bill Jenkins, later WXIX-TV's general manager. Today listeners are hearing some of the county classics "which were pivotal in our growth as a station, which we don't play these days. We're going to have some fun with it," says program director Grover Collins, who came here in 1997. Listeners woke up today with Johnny Cash's "Ring Of Fire," Dolly Parton and Kenny Rogers' "Islands in the Stream," Alan Jackson, Randy Travis, McEntire, Twain and other country stars. Collins remembers when a young Luke Bryan was playing the Madison Theater in 2009 when he invited the future superstar to a Christmas season B-105 remote broadcast at the Duke Energy Convention Center. "You just never know who's going to blow up. In 50 years, anybody who is somebody today came through the station – Blake Shelton, Jason Aldean, the Dixie Chicks," Grover says. Aldean was on B-105 this morning announcing that his Aug. 22 Riverbend Music Center concert will be "the official B-105 50th Birthday Bash." WUBE-FM T-shirt displayed by Media Heritage at the main public library downtown in 2017. The legacy AM and FM country stations have provided paychecks to many popular personalities: Larry B, Dave Bunce (aka Dave Lee), Dale Sommers (before his WLW Truckin' Bozo days), Amanda Orlando, Eric "Bubba Bo" Boulanger, Bill Whyte, Jackie White, Jack Reno, "Judge" Roy Wakely, Kathy O'Connor, Marty Thompson, Pistol Pete Miller, Ernie Brown, Jim Fox, Jack Stahl, Paul O'Brien, Tim Closson, John R.W. Wailin, Patti Marshall, Mike Chapman, John Summers, Jake "The Snake" Kinkaid, JC McCoy, Jeff Davis, Ted McAllister, Joanne Grueter, Kim Beeson, Gina Matthews, Holly Morgan, Dr. Don Carpenter, Chris Carr and Jeff "Maverick" Bolen. A comprehensive roster of WUBE's on-air staffers, compiled by lifelong fan Bob Williams, can be found on the Memories Of WUBE Country Radio Facebook page. Williams also has posted news stories and photos on the page. 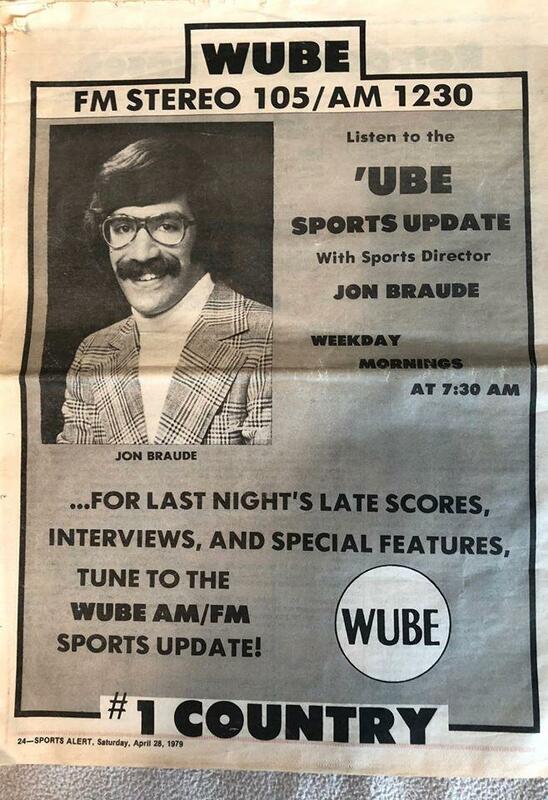 Ad for WUBE sportscaster Jon Braude before he joined the Cincinnati Reds publicity staff. WUBE's full-service news team in the 1970s and '80s included Edie Magnus (before Channel 12, ABC, CBS and NBC); John London (before WLWT-TV); Karla Stanley (before Channel 12 and 19 news), meteorologist Steve Horstmeyer; Fred Slezak; Mark John Holiday; Doug Anthony and sports reporter Jon Braude (before being Reds publicity director). WUBE-FM alumni also include Cincinnati native actor Thom Barry (Cold Case, Independence Day, Grey's Anatomy) and comedian Roger Naylor. Today's line-up of Big Dave, Jason "Stattman" Staff, Duke Hamilton, Jesse Tack and Amanda Valentine will be promoting the "Birthday Bash" concert with Aldean, Kane Brown, Dee Jay Silver and Northern Kentucky native Carly Pearce. Unlike some TV and radio stations, who abandon their past in pursuit of the future, WUBE plans to celebrate its golden anniversary "not just for a day, but for all summer." WUBE is promoting the "B-105 Mega Ticket 2019" at Riverbend for country stars Rascal Flatts, Dirks Bentley, Brad Paisely, Florida Georgia Line, Thomas Rhett, Bryan and Aldean. 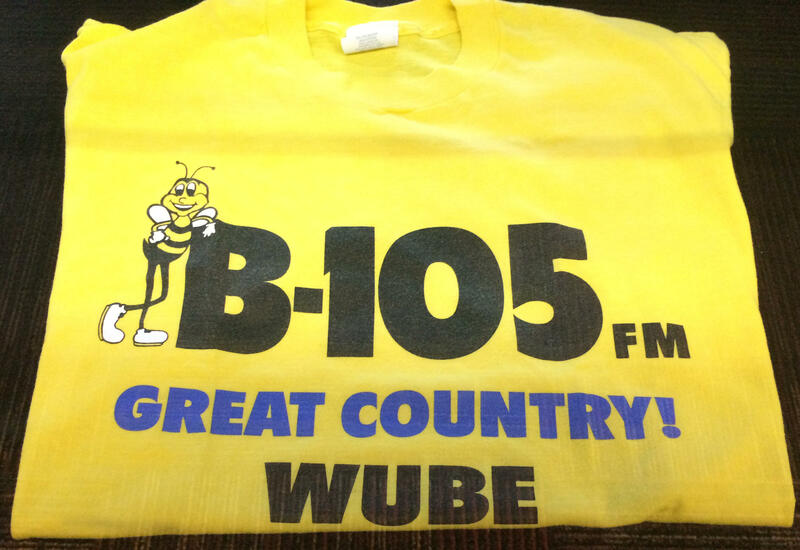 Over the years, after country became cool, B105 has survived challenges from WSAI-FM, "KIX country," "The Beaver," "The Eagle" and today from WNNF-FM's NASH 94.1, Dry Ridge's WNKR-FM and Middletown's WNKN-FM. It also endured ownership changes from Kaye-Smith, Chancellor, AMFM, CBS, Infinity, Entercom, Bonneville to Hubbard. A 1976 ad for WUBE, a year before Duke Hamilton arrived. Along the way B-105 has collected five Country Music Association (CMA) Station of the Year awards; two NAB Crystal Awards for community service; a National Association of Broadcasters (NAB) Marconi Award for Country Station of the Year; and one Academy of Country Music Station of the Year award. WUBE DJs also have collected four CMA Personality of the Year awards and four ACM Personality of the Year awards. "It's been a great ride, says Hamilton, a Missouri native who was inducted into the Country Radio Broadcasters’ Disc Jockey Hall of Fame in 2003. "I figured they had the right formula here to be successful, and when I realized that, that's why I decided to stay."